Minneapolis has coasted down to the #2 spot on Bicycling Magazine's Top 50 Bike Friendly Cities list, from being named the best bike city last year. This is a good thing, in my opinion. It encourages us to keep working, stretching, trying new approaches, implementing the recommendations in the bike plan. Also fun: the Bicycle Advisory Committee is called out as one of the things that makes Minneapolis a great bike city. The city has lost a landmark: Walker Church burned down on Sunday after being struck by lightning. It's a devastating loss to the members of the Walker community, many of whom put hours and hours of their own labor into maintaining the 100+ year old church. It's also a blow to the many community groups who used the building for office and meeting space, including Communities Unitied Against Police Brutality and Occupy MN. I'm writing about this because it's also a loss to me and my family. Though I'm not a member of Walker, it's the church my father served until his death in 2005, the church that filled to capacity for his funeral. My sister and mother - clearly singing her heart out - appear in the Star Tribune's front page photo of the Walker congregation. Walker was a beautiful building. The sanctuary had a stage, seating and acoustics so good for live performance that a group of friends and I organized a short-lived cabaret there in the early 2000s. The floor felt almost sprung, and seemed to sway with the congregation when they sang 'Amazing Grace' or 'Everybody's Moon.' It felt comfortable, even cozy, a welcoming physical space that suited its uniquely welcoming congregation. I want to thank the Minneapolis firefighters who tried to save the Walker, especially those who were injured: Kathrynne Baumtrog, Captain Paul Baumtrog, Captain Joe Mattison, Firefighter Sandy Meredith and Firefighter Christie Nixon. As traumatic as this is, I am confident that the Walker community will stay strong together. As Walter Lockhart said, the people are the church. And the seeds they've planted in the community are now ready to support them in their time of need. For example, In the Heart of the Beast Puppet and Mask Theater, which started at Walker, has offered to let the congregation worship in its theater on Lake Street. It's a new journey, and it will be difficult. But I know the folks from Walker will go together, and will sing the whole way. On the expected, razor-thin 7-6 vote the City Council today voted to fork over hundreds of millions of dollars for the Minnesota Vikings, in violation of the Minneapolis Charter. This represents the largest act of corporate welfare in Minneapolis history. Future generations will look back on this deal as a terrible day for Minneapolis, and will have a hard time cleaning up this mess. We will all be held accountable by the voters in our wards for our stances on this issue, but the damage has been done. One of many details that makes the Vikings stadium deal a bad deal for Minneapolis: the lost property taxes from the stadium site itself. Earlier this month I learned that with the new expanded site eleven property tax paying addresses would become tax exempt. That would result in the City, State, County and School will losing a total of $476,000 a year. The stadium itself will be worth somewhere around $975 million. According to the Minneapolis Assessor, a building valued at $975 million in today's market, suing today's formula, would pay $41 million in property taxes. That's $41 million per year. Now, that number would depreciate, and such an increase in the tax base would mean that we'd have to recalculate the taxes for the city as a whole. But that's a ballpark number (pun intended). That amounts to 41 million that the rest of the property owners in Minneapolis would not have to pay and would be "growing" our tax base which is probably the best thing we can do to control and lower property taxes. I realize that the Metrodome has also been off of the property tax rolls since its construction. But the continued loss of this property tax revenue is yet another hidden subsidy for the Vikings and their owners, and should be added to the overall cost of this deal. "Article 1 Sec. 21 [473J.19] PROPERTY TAX EXEMPTION; SPECIAL ASSESSMENTS. Any real or personal property acquired, owned, leased, controlled, used, or occupied by the authority for any of the purposes of this chapter, is acquired, owned, leased, controlled, used, and occupied for public, governmental, and municipal purposes. The stadium and stadium infrastructure are exempt from ad valorem taxation by the state or any political subdivision of the state provided that the properties are subject to special assessments levied by a political subdivision for a local improvement in amounts proportionate to and not exceeding the special benefit received by the properties from the improvement. No possible use of any of the properties in any manner different from their use under this chapter may be considered in determining the special benefit received by the properties. Notwithstanding section 272.01, subdivision 2, or 273.19, real or personal property which is subject to a lease or use agreement between the authority and another person for uses related to the purposes of this chapter, including the operation of the stadium and related parking facilities, is exempt from taxation regardless of the length of the lease or use agreement or the characteristics of the entity leasing or using the property. This section, insofar as it provides an exemption or special treatment, does not apply to any real property that is leased for residential, business, or commercial development or to a restaurant that is open for general business more than 200 days a year, or other purposes different from those contemplated in this chapter." For those, like me, unfamiliar with an 'Ad Valorem Tax,' it is a tax based on the assessed value of real estate or personal property. City property ad valorem taxes are also known as "property taxes". I know that some state legislators tried to remove this provision from the bill and that is one reason why I attempted to amend our legislative agenda at the Council Committee meeting, (after the majority approved the section of the bill that requires local consent) to add a provision that we would support amending the 2012 Stadium Bill, Article 1, Section 21 to remove the property tax exemption for the stadium. After sensing resistance from some of my colleagues I substituted the motion to merely direct staff to study making such an amendment. even that failed on a 6-6 vote with one Council Member absent at the time of the vote. I am very supportive of this: keeping our energy options open by exploring creating a Minneapolis municipal utility for electricity and/or natural gas. It's clear to me that Minneapolis residents want to wean ourselves from fossil fuels and nuclear power, and to use energy more efficiently. The existing utilities are not moving us towards that goal as quickly as we could if we took democratic control of our utilities. The City runs a very successful water utility, so successful that we sell water to other surrounding communities. Water is one of the highest-rated services provided by the City. We can clearly run a utility well, at a reasonable cost. Along with the fact that many other cities - including both small communities and major metropolitan areas - already have municipal utilities, this gives me the comfort to move towards creating a municipal utility. As the energy utility franchise agreements expire, it's the right time for us to ask these big questions. I look forward to working on the campaign to keep our energy options open. The AARP has registered a ballot question fund to fight the Republican-led constitutional amendment to require voters to show a photo ID. This is good news - the AARP has 650,000 members in Minnesota. This news also highlights the basic problem with this amendment: it will make it harder for certain types of Minnesotans, including the elderly, college students and immigrants, to vote. And that is not an unwanted side-effect, that's the purpose of the amendment. At some point, the Republican Party of Minnesota appears to have decided that it's a better electoral strategy to turn people who disagree with them away from the polls than to earn their votes. Keep fighting the good fight for a fair and open democracy, AARP! This is cool: a new tool called Bike Score that gives a composite 'grade' for cities and neighborhoods on how bikeable they are. The score is based on bike lanes, hills, biking destinations and the number of bike commuters. The kicker? Minneapolis ranks highest among major cities in the US, with a composite score of 79 out of 100. We beat out other great bicycling towns like Portland (which got only a 70), San Francisco (70), Seattle (64), Chicago (62), and New York (62). Some of that is pretty clearly due to our lack of hills relative to some of these other cities. However, we also have a better spread of bike facilities throughout our community than one sees in most other similar cities, and a good spread of bike commuting. On that last note, I find it very interesting that the Second Ward is one of the "greenest" spots in Minneapolis on the bike commuting map. The University likely has a lot to do with that, but high levels of bike commuters extend down through Seward into northern Longfellow as well. All in all, Ward 2 gets a high bike score. Put another way, Ward 2 is one of the most bicycle-friendly areas of the most bicycle-friendly large city in the US. The Solid Waste and Recycling Division of Public Works has returned with their recommendation on the Minneapolis recycling program: we should move to a single sort system. You can read the executive summary here and a very interesting powerpoint here. A single sort system will allow us to increase the amount of waste being recycled from our current, rather dismal 18% up to 32%. That's still not as high as I'd like it to be, but it's a major improvement. According to the study, a dual sort system would also increase waste diversion, but only to 25%. Processing for commingled recycling has gotten better, and processing costs are basically equal between single and dual sort. Staff are projecting that a single sort recycling program will cost the City 20% less to operate than the current multi-sort system, even taking the upfront costs for a new recycling cart for all Minneapolis residents into account, while increasing the amount of recyclable material we collect. The trend among similar cities is clearly moving towards a single-stream system. A single stream system is arguably more compatible with source-separated organics collection, because the two combined would only require three carts, not four. The Council's Transportation and Public Works committee approved staff's recommendation to move forward on changing our recycling system to single stream. This will come before the Council next week, and I will enthusiastically support it. It's well past time for us to get serious about increasing our recycling rate, to pull reusable material out of the waste that goes to the garbage burner downtown. A single stream collection program will be easier for residents to use, increase the recycling rate and decrease costs. This change is a win-win-win, and I'm thrilled we're moving forward on it. Just like in the House, the majority of Minneapolis State Senators voted against the stadium bill. Again, if this is a good deal for Minneapolis, why couldn't stadium boosters convince two thirds of our senate delegation to vote for it? House: nine out of eleven opposed. Senate: four out of six opposed. Council: six out of thirteen opposed. Maybe the stadium deal really is a bad idea for Minneapolis residents? As you can read here, the Minnesota Department of Public Safety has launched a criminal investigation into the allegations that police officers participating in the Drug Recognition Evaluator program gave drugs to Minneapolis residents. This investigation was sparked by the allegations made on the Occupy video. In particular, an officer from Hutchinson, MN is under investigation for giving drugs to DRE subjects. Public Safety Commissioner Mona Dohman has also suspended the DRE program until the investigation is complete. This is a very big deal. I look forward to getting more information from this investigation, but it clearly indicates to me that the allegations made in the Occupy video were legitimate (and not, as some have asserted, some sort of left-wing conspiracy to make the police look bad). I commend these individuals for having the courage to come forward and testify at a City Council Public Hearing. I also applaud the Public Safety Commissioner for being willing to suspend this program until the investigation is complete. From my perspective, at this point the program has zero credibility. It appears that at least one officer who witnessed came forward with information, and I also highly commend him or her. It is not easy for police officers to 'inform' on each other, in my experience. All this said: even once the investigation is complete and even if the program is been changed to make sure this sort of thing doesn't happen again, I do not believe that it should operate in Minneapolis. Minneapolis police do not participate in this program, so it has no real benefit to our city. I'd prefer that the program be permanently ended, but if this type of program is to exist I think it should be run by a public health institution or an accredited college or university. At least we should demand that if police or sheriffs from out state Minnesota want to see what drug use looks like they do it outside Minneapolis and not involve any the residents or visitors in Minneapolis. Senator John Marty has amended the Minnesota Senate's Vikings stadium bill to prohibit the Legislature from exempting the stadium from the Minneapolis Charter's provisions on publicly funding stadiums. Way to go John! With the 1997 Charter amendment becoming a major focus for folks on both sides of the stadium debate, I thought it might be a good idea to give a little context on it. The amendment passed with 70% of the vote back in '97. That's huge in itself, but it's also interesting to point out that more than 62,000 people voted for it. That's more people than have voted for any candidate or ballot question in any Minneapolis municipal election in almost 20 years. Mayor Rybak hasn't gotten 62,000 votes in any of his successful mayoral bids. He scored 57,739 in 2001, 43,198 in 2005 and 45,157 in 2009. His predecessor, Sharon Sayles Belton, never scored over 62,000 votes either, netting 59,269 in 1993 and 52,222 in 1997 (a little under 10,000 votes less than the stadium referendum that same year). No candidate for any other citywide office (Park Board at-large, Board of Estimate and Taxation, Library Board) has ever received more than 62,000 votes. And this is the Charter provision that a razor-thin majority of my colleagues on the Council, the Mayor, the Governor and the majority in the Minnesota House want to ignore. The Minnesota House of Representatives has passed a Vikings stadium funding bill. The changes that were made before it passed do not substantively change the impact on the people of Minneapolis, and I continue to oppose it. One of the clearest indications of how flawed this plan is: only two members of Minneapolis' House delegation voted for it, with the rest voting no. If this stadium is a good deal for Minneapolis, why did the vast majority (81%, by my math) of our elected officials in the House vote against it? I applaud the courage of the Representatives who stood up to the lobbying pressure of the NFL, the Vikings, the Governor and the Mayor and sided with the people of Minneapolis by voting no. Here are some more details about Hassan Aden. On Saturday, a jogger found a body near the Franklin Avenue bridge. As you can read here, the Medical Examiner has positively identified the body as that of Hassan Aden, the young Somali man who has been missing for over two weeks. A cause of death has not yet been released, and will be available in another 4-6 weeks. My heart goes out to Hassan's family. I can only imagine how difficult it would be to lose a child in this way. It sounds like he was a wonderful young man, and his loss hurts not just his family but the community as a whole. Late Monday evening, the police responded to a stabbing call at 512 Cedar Ave S. They found Abdurahman Warfa dead from a stab wound to the neck. Minneapolis Police arrested and the Hennepin County Attorney's Office has now charged Abdirahim Hahmed Jama with two counts of Second Degree Murder. It seems the two were roommates, and the stabbing occurred in the apartment they rented together. There are several explanations for what happened, and I look forward to getting more information as the case progresses. This is the only homicide in the Second Ward in 2012. Mayor Rybak has nominated his Chief of Staff, Jeremy Hanson Willis, to be the next director of the City of Minneapolis Department of Community Planning and Economic Development (CPED). Hanson Willis has served as Mayor Rybak’s chief of staff since 2009 and has been the Mayor’s primary liaison with CPED. Prior to making the formal permanent appointment, the Mayor has appointed and the Executive Committee (with my support) has confirmed Hanson Willis as interim director for 3 months. I am disappointed that a new CPED Director with a Planning background and more experience managing large budgets and staffs was not found. The fact that Hanson Willis is the Mayor's Chief of Staff also gives me some pause. However, I intend to be open minded and think that the interim period will give Mr. Hanson Willis an opportunity to demonstrate his capacity to be successful in this very important position. 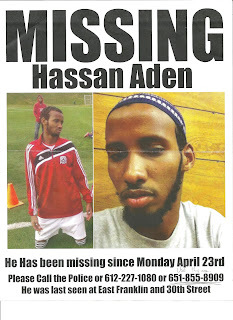 An 18 year old Somali man named Hassan Aden has been missing for more than a week. Monday, April 23rd, on his way back from school at Higher Ground Academy in St. Paul, he got off the school bus earlier than usual. He lives at 7th and Cedar, but exited the bus at Seward Tower East. The last time anyone saw him, he was walking towards the condo building on the northeast corner of East Franklin and 30th Ave S. He has not been heard from since. His family is understandably quite worried about him, and are asking anyone who may have seen him last week to call them at 651-855-8909, as well as contacting the police department. The Council's Public Safety, Civil Rights and Health committee heard some disturbing testimony yesterday about how the State's "Drug Recognition Evaluator" program is being implemented in downtown Minneapolis. The purpose of this program appears to be to train police officers from outstate areas on what people look and act like when they are under the influence of a given street drug. A video has been released on independent media that seems to show police officers from non-Minneapolis jurisdictions (Rochester, Mora, etc.) picking up young people from Peavey Plaza and returning them under the influence of marijuana and other drugs. Some of the participants claim that the police actually provided them with the drugs they consumed. One of the people on the video appeared to be close to the age of 18 and reported about how he was recruited, transported, given illegal drugs and asked to used them in a secluded location by government employed public safety employees. I have asked the Police Chief and Mayor to give me information about the extent of the MPD’s involvement in this. I have also requested that if we had any role in permitting this program to operate in Minneapolis that we suspend that permission. I am deeply disturbed that downtown Minneapolis is being used as a place for outstate cops to find drug users, get them more intoxicated, and then deposit them back on Minneapolis streets. In my opinion, it is not appropriate for Minneapolis to serve as the "drug education zone" for cops from the whole state. I also find it deeply troubling that this DRE program seems to have targeted the area of the Occupy protests. One of the talking points of those who want to shut down the Occupy protests (supporters of the Johnson resolution both on the Council and in the community) is that Occupy has brought more drug use and intoxicated people to Peavey Plaza. It now seems that law enforcement officers have played a major role in bringing drug use and intoxicated people to the plaza. Was this site chosen with the intent of undermining Occupy's credibility, or is it just a coincidence? Or did the officers participating in the DRE program target Occupy because they view the protesters as a collection of drug users? As I see it, this new information calls into question all of the "evidence" that Occupy has increased crime and livability problems on the plaza, strengthening my opposition to the Johnson resolution. Two nights ago I had a long conversation with a concerned mother who was very upset because her son had been given free drugs by a police officer when he went out to participate in what he thought would be social action in a public plaza to help improve his community and country. She was shocked to learn from her son later that police gave him illegal drugs and asked him to use them, indicating that it was okay and that it was part of a police program. She expressed concern about her young son and his particular mental capacity to make sound judgments under such conditions. She shared her fears about unknown substances that are often used as additives to marijuana and recalled her own experiences, and those of her families and friends, dealing with substance abuse and addiction. Her trust in the police was broken and she was baffled at how such a thing could ever be condoned by her government. She felt that it was the police's responsibility to help keep her son safe and protect him from harm and consider that by their action the police had put him in harm’s way. She recalled how often those wishing to profit from the sale of drugs often used free samples to help get people "hooked" and almost could not believe that here it was the police giving her son a sample with apparent total disregard for his welfare. I can appreciate that it is in the interest of the public to have a well-educated police force, able to identify intoxicated people, but there must be better, more ethical, alternative ways to provide them that education. I wonder how health professionals, who also need to be able to make these determinations, learn that information. I wonder if the State Department of Health was consulted and approved of this program before it was implemented. It would be interesting to hear from our own health professionals about this. Minneapolis Police Chief Tim Dolan, who has led Minneapolis’ police force since 2006, announced April 25th that he will not seek a third full term as chief and will retire at the end of 2012 after a 29-year career with the Minneapolis Police Department. Mayor Rybak first nominated Dolan to serve as interim chief in 2006. The City Council confirmed Mayor Rybak’s nomination of Dolan to three-year terms as chief in 2007 with my support and in 2010 without it. Before becoming chief, Dolan served in numerous command and leadership capacities in nearly every part of the city, including as deputy chief, inspector and commander of the 4th Precinct in North Minneapolis, commander of narcotics, commander of emergency response and director of training. I am grateful to Chief Dolan for his years of service to the people of Minneapolis and despite some differences I have enjoyed working with him as Council Member. He has been very helpful responding to crime concerns in Ward 2 and has been an outstanding partner in our efforts to curb domestic abuse and prevent youth violence by addressing it as a public health as well as a public safety issue. The biggest difference I had with the Chief was on police accountability issues, especially his stance towards the Civilian Review Authority. In my view, he consistently and significantly undermined the CRA by refusing to discipline sustained CRA complaints. He committed to a goal of 100% discipline for sustained CRA complaints before he was first appointed in 2006. Unfortunately, he never came close to meeting that goal, and his actual record on this in recent years was dismal. That was why I did not support his reappointment in 2010. The Council has received multiple reports from the CRA detailing the Chief's lack of proper participation in the CRA process, and it's been extremely disappointing. The Mayor has nominated Assistant Chief Janee Harteau to be our next Police Chief. I know Janee well; she served as First Precinct commander (the First Precinct covers the West Bank) during my first years in office. I believe that she will do a good job, though I will be interested to hear from her whether she will chart Chief Dolan's course on police accountability.